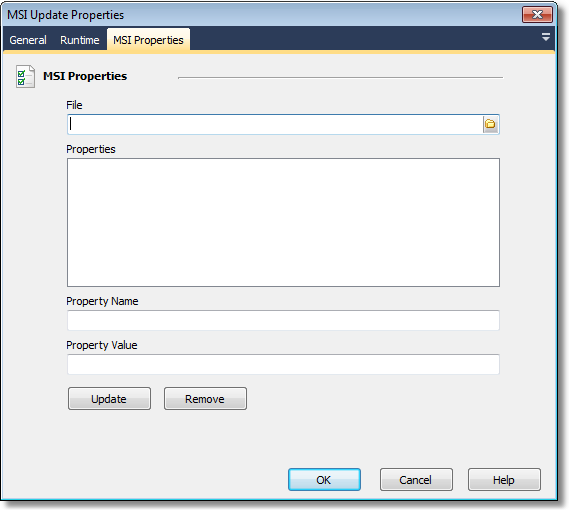 The MSI Update Properties action enables you to alter existing properties within an MSI Database. Note: This action will not add or remove properties from the MSI database, it will only update existing properties. The location of the MSI file to be updated. The list of properties contained in the MSI database. Once the MSI file has been specified, a list of all the properties will be available from here. The name of the property to update. If the name cannot be found in the Properties list when Update is clicked, it will be added. The value of the selected property. The update button will save the changes made to the Property to the Properties list. The remove button will remove the selected Property from the Properties list. Neither of these buttons will actually remove items from or insert items into the database, they are simply there to allow alteration of the properties list.